In case you missed our coverage yesterday, BlizzCon’s biggest announcement came in the form of Diablo: Immortal, it’s spin on bringing the Diablo game to mobile platformers. While a certain vein of gamers met the news with angst, those that actually appreciate mobile gaming as a platform met the news with hopeful enthusiasm. Of course, such an announcement was met with a lot of unanswered questions. Would this really be the Diablo experience? How would in-app purchases be handled? How are the controls going to work? We sat down today with members of the Diablo: Immortal development community to try and get some answers. 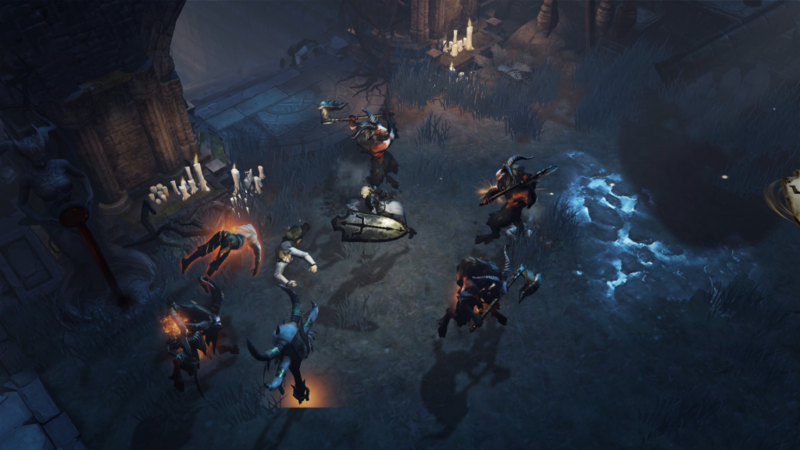 Diablo fans fearful of Immortal being a watered down version of the venerable series should hopefully have little to fear, as the goal seems to be to translate the full version of Diablo to the mobile platform. When I asked if we should expect to see the staples for a Diablo game (a robust loot system, character customizability, and character progression), I was told that all those staples will make it into Diablo: Immortal. While the hands-on demo we reported on yesterday was a bit light on those aspects, the full game will have more skills that you can switch between and players will have full control over their inventory with a loot system that should feel familiar. Part of that full Diablo experience includes an immersive story and the flexibility to take on a variety of different missions. While one of the points of emphasis is the ability to play Immortal in a variety of portable situations, that doesn’t mean that the game will be relegated to bit-sized chunks of gameplay and stages. 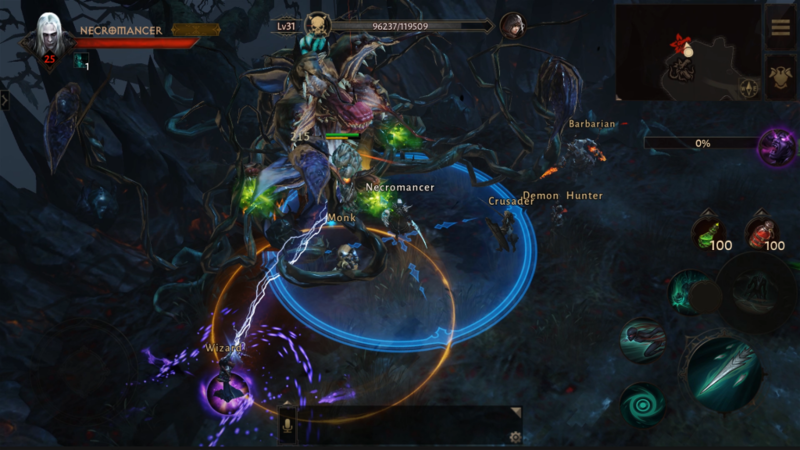 The examples provided mimicked the current offerings of Diablo 3, where you can log in and do a quick rift run or bounty if you’re short on time, but you also have the ability to play through longer story content that may require some investment. This sort of scheme is envisioned for Diablo: Immortal, which hopes to satisfy the itch for mobile friendly and couch friendly content. One of the key points that was emphasized throughout our interview are the multiplayer aspects of Diablo: Immortal. For example, public zones will be always online and you’ll be able to encounter players running around and group with them, ignore them, or provide assistance without any formal grouping. 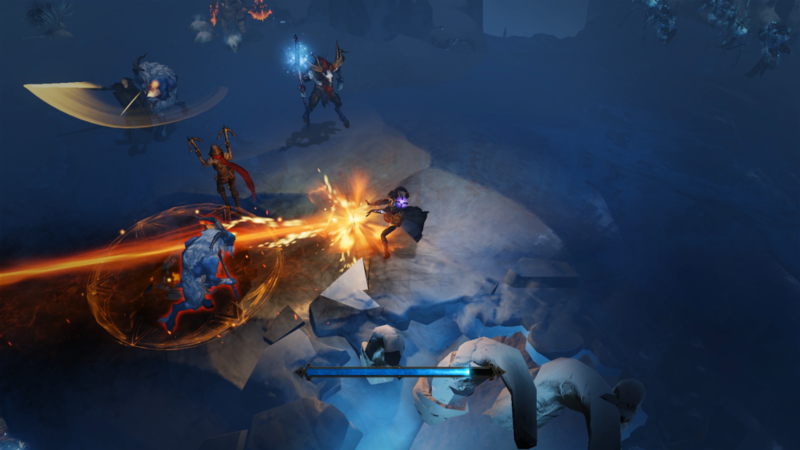 The term tossed around was giving Diablo: Immortal a feel of being a mobile MMO from a multiplayer standpoint. Immortal players will also have access to their battle.net friends list, and there will be an emphasis on forming and joining guilds, which is another mobile staple. A capital city is also envisioned, which will be one of the main hubs for players to meet up. The emphasis on social interactions should be obvious, as Diablo plays at its best when you’re teaming with friends and the goal is to preserve that social foundation within Immortal. Unfortunately, we weren’t able to get confirmation as to cross-platform play between Android and iOS devices, but considering the emphasis on wanting to emphasize the multiplayer appeal, I would imagine it’s a fair bet that it’ll occur. As we mentioned in our hands-on a yesterday, I was a pretty big fan of the control scheme in the demo, which essentially mimicked that of games such as Arena of Valor. As for why they chose that specific scheme, it seemed to be the most natural fit for creating a mobile action RPG. While I personally think it’s probably the best scheme available, I asked about the possibility of alternate control schemes or possibly the use of third party controllers. The responses provided weren’t too encouraging for either one of them, with the focus being on mastering the control type they chose, and then potentially branching out into other alternatives in the future once they are confident that their singular control scheme is as accessible to everyone as possible. I was told that a controller didn’t feel like an instinctively good fit, so I’d put my money on alternative touch control options prior to any possibility of controller support. Diablo: Immortal will have iPad support, but we did have a discussion as to whether or not it would be comfortable gaming experience. At that point, it would really be dependent more on the player themselves, and not necessarily the game making changes between cell phone and tablet devices. I was mostly just happy that at least tablets are being considered. I could tell that IAP was a topic heavy on the minds of Blizzard. In case you haven’t checked the news recently, IAP is probably the biggest complaint being levied against Diablo: Immortal after it was announced to be a mobile title. While I wasn’t able to get any specific information about Immortal’s monetization or IAP plans, I was left with a statement that does alleviate some of my concerns. As was a theme throughout the interview, the goal of Immortal is to bring the Diablo experience to the mobile platform. With that statement, I was told that anything that interferes with the Diablo and Blizzard gaming experiences would not be something that would (or should) make it into the game. Does this mean that we won’t be seeing any freemium or IAP experiences in the game? It’s tough to make that judgment at this point, although I will point out that freemium systems such as energy would be something squarely in the “interfering with the Diablo experience realm.” The nature of the mobile device market does mean that some devices would not be compatible with Diablo Immortal when it eventually releases, but they haven’t yet decided as to where that minimum spec will fall on the hardware gradient. Beyond that, Blizzard was pretty mum on the remaining topics I brought up. There were no current announcements as to the launch window, and there wasn’t even a confirmation that the iOS and Android versions would even be released simultaneously. The best I was told was Diablo: Immortal will be released when it’s ready, which is that classic “Blizzard Soon” mantra that works for all their games. I asked about the possibility of future Blizzard content on mobile with little success. I would imagine, however, that a successful Diablo: Immortal may lead to other mobile content in the future. While I really hoped that Blizzard would divulge at least a launch window for Diablo: Immortal, I’m satisfied with the company keeping their cards close to their chest if it means that we’re going to get a good game in the end. Otherwise, everything I’ve seen of Immortal leaves me wanting more. We’ve seen a lot of irrational takes and comments on this game over the last few days taking a strange zero-sum interpretation of Blizzard’s announcement. In my view, there’s nothing wrong with taking a great series like Diablo and making it more accessible to the tens of millions of mobile players. As long as the game is done well (and at this point, I have yet to see a reason why it won’t), isn’t this a good thing? Rest assured, we’ll be keeping a close eye on this title moving forward as we hope its release is sooner rather than later.